A work of non-fiction, In the Garden of Beasts by Erik Larson provides insight to what it was like in Germany in 1933 and 1934 as Hitler and his henchman consolidated power. The factual accounts from the historical records and journal entries come primarily from the new American Ambassador to Germany, William Dodd and his family. Dodd served for four years before being recalled. 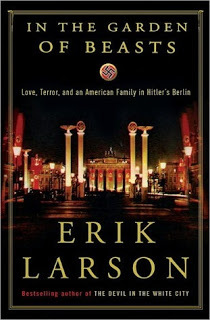 While the book focuses mostly on 1933 and 1934, it does also provide glimpses up to 1937 in Germany and provides accounts of what became of some of the main actors through their lives.To his credit Larson, has taken historical fact as are available and weaved a factual story that is both compelling and terrifying. The German people and the world were lulled into thinking that Democracy was still alive and well up until the point that Hitler consolidated his power. Dodd and few others could see what was happening, though even in the Dodd family, primarily his daughter Martha, seemed to fall under the Nazi spell for a short time. While Dodd warned of impending doom, many in power within the U.S. State Department downplayed Hitler’s action in those years just before he had consolidated power. By the time infamous Night of the Long Knives happened, it was too late. The monster that was Hitler and his government couldn’t be stopped as a democracy turned into an autocracy. Unfortunately while there were invaluable lessons to be learned from this time period, many countries still fall prey to leaders who turn democracy’s into autocracy’s.